Roast chicken is probably one of the ultimate comfort foods and if you’re staying in at the weekend its nice to have a little more time to prepare a traditional roast dinner. This recipe offers a bit of a twist, is relatively quick to put together and is great for sharing with friends. Turmeric, lemon juice and black pepper are my ‘Charlie’s Angels Superfoods’ for this recipe. Earthy, golden turmeric offers its potent anti-inflammatory powers that are enhanced by heat-bearing black peppercorns whilst bright and sunny lemons are packed with vitamin C and antioxidants. I’m serving the chicken with ever popular sweet potato fries and a crunchy green bean salad topped with vitamin E-rich toasted almonds. This dish is high in protein, low in sugar and rich in fatty acids, vitamin C, vitamin A, vitamin K, potassium and antioxidants. Arrange the chicken pieces onto a large roasting tray. Sprinkle the turmeric, salt and pepper onto the chicken, squeeze over the juice of two lemons (tuck the squeezed lemon quarters between the chicken pieces) and drizzle over the coconut oil. Put the chicken into the oven for 35 minutes until the skin is crispy and the chicken is cooked through. In a separate roasting tray spread the sweet potato chips in one layer, season and add coconut oil. Put into the oven and bake for 30 minutes until crispy and golden. While the chicken and sweet potato are in the oven, prepare the green beans. Bring a saucepan of water to the boil, add the green beans and cook for 3-5 minutes. Drain, transfer to a serving dish and lightly season with sea salt. Scatter the flaked almonds onto a small frying pan and toast over a medium heat until golden (be careful not to burn). Remove from the heat and toss the almonds with the green beans. When the chicken and sweet potato fries are cooked remove from the oven and transfer to separate serving bowls. Place the chicken, green beans and sweet potato in the centre of your table and dig in! Experts say “dozens of easy-to-find ‘Superfoods’ can help ward off heart disease, cancer, cholesterol, and more”. So let’s find out what they are and how we can incorporate them into our daily diets. Listed below are some everyday Superfoods to that you should try to include in your diet. Spirulina is a type of blue-green algae that is rich in protein, vitamins, minerals, and carotenoids and antioxidants that can help protect cells from damage. It contains nutrients, including B complex vitamins, beta-carotene, vitamin E, manganese, zinc, copper, iron, selenium, and gamma linolenic acid (an essential fatty acid). 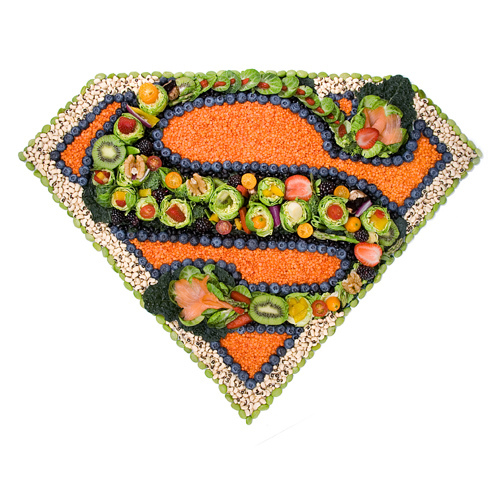 The super food has over 100 nutrients, more than any other plant, grain or herb. Widely used as a food supplement for maintaining health, energy, weight loss and cleansing programs. Protein – 60-70% of its weight. 300% more protein than fish, meat or poultry, with no cholesterol. Iron – 58x richer than spinach in bio-available iron. Vitamin B12 – Natures richest source. Often lacking in a vegetarian diet. Chlorophyll – 2x richer than barley grass or wheatgrass. Anti-oxidants – 25x richer in beta-carotene than carrot and 3x richer in Vitamin E than wheat germ. Assists weight loss by curbing appetite naturally while supplying a full range of nutrients needed for a balanced diet. As an unrefined wholefood, Spirulina is absorbed up to x16 more effectively than synthetic multi-vitamin and mineral supplements.